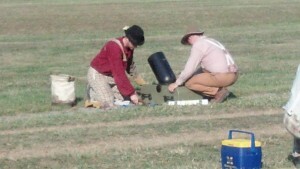 I made my first visit to the North-South Skirmish Association meet on Friday at Fort Shenandoah about ten miles northwest of Winchester. 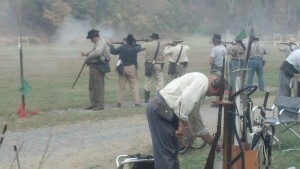 The competitive shooting matches with Civil War era weapons brought teams of reenactors plus history fans from far and wide. The five-day competition attracted some 2,000 competitors and about 10,000 spectators according to a Winchester Star article [10/7/13] by staff writer Matt Armstrong. The N-SSA has meets twice a year, in May and October. Because of my numerous family, writing and airline commitments I had never attended any of these events until last Friday. Thanks to an invitation from Carole Miller, manager of Winchester’s Old Court House Civil War Museum, I joined her next to sutlers row. A number of folks stopped by to talk about books and the conversation consistently turned toward the absurd Government shutdown. The conservative flavor of the event was thick in the air, like the gunsmoke. A glance across the road at the numerous vendors hawking guns and ammo, plus NRA and various anti-government stickers on vehicles, made me ponder how many undercover ATF agents might be in the crowd. When I mentioned this to Carole Miller she admonished me with a stern look to keep my voice down as she pointed skyward. “The drones might hear you,” she said. This brought on something else to ponder amidst the beautiful warm Shenandoah Valley afternoon. Government drones and agents aside, at the end of the day I realized how thankful I am that so many citizens still value the history of our great country. Many of them are willing to take time off from work and to travel long distances to celebrate their passion. It was a lot of fun to talk with many of them. Thanks especially go out to Jim, the archaeologist from Atlanta; several other Georgians from Butts County, Georgia; Mike from Botetourt County, VA who was accompanied by his 15-year-old daughter plus the numerous guys I met from Pittsburgh. I will look forward to attending another great N-SSA event again next year.